The risk and downtime of server migration have locked many IT teams into platforms that are no longer ideal. Migrations are often delayed or avoided—whether it’s moving data to the cloud or back on premises, or upgrading the hardware of the database software. This results in lost opportunities, unnecessary costs, and a lack of agility that today’s IT teams can no longer afford. 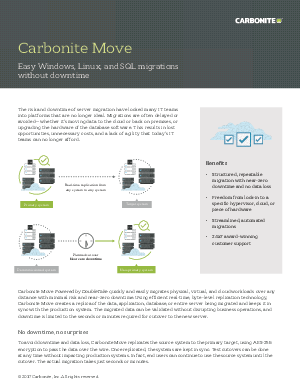 Carbonite Move Powered by DoubleTake quickly and easily migrates physical, virtual, and cloud workloads over any distance with minimal risk and near-zero downtime. Using efficient real-time, byte-level replication technology, Carbonite Move creates a replica of the data, application, database, or entire server being migrated and keeps it in sync with the production system. The migrated data can be validated without disrupting business operations, and downtime is limited to the seconds or minutes required for cutover to the new server.